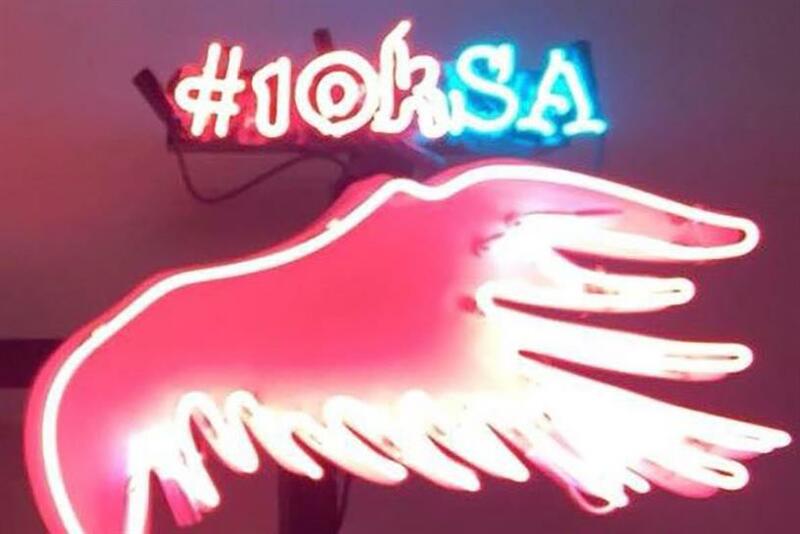 Princess Reema asked SXSW attendees to take photos in front of pink neon wings and share them via the hashtag #10KSA. AUSTIN — Saudi Arabia’s Princess Reema Bint Bandar Al-Saud launched a breast cancer awareness campaign at SXSW Interactive on Saturday. Princess Reema’s goal is to bring together 10,000 Saudi women in Riyadh this October to educate them about breast cancer and other health issues. If successful, the event would be the largest-ever gathering of women in Saudi Arabia. Speaking in a keynote at the festival, Princess Reema asked SXSW attendees to take their photo in front of a set of neon pink wings in the Austin Convention Center, and then share it on social media with the hashtag #10KSA. She said she hopes the social media activity will raise awareness of her cause and bring more visibility to the event. By gathering together Saudi women, 10KSA will aim to form the world's largest pink humanitarian ribbon on record. That would beat the record that the Zahra Breast Cancer Association previously set in 2010 at a similar event with nearly 4,000 women. Breast cancer is the leading cause of cancer death for Saudi women ages 20 to 59, but the topic is taboo in Saudi Arabian culture, Princess Reema explained. "I want to kick [breast cancer] up to be a mainstream conversation," she said. The event in October will feature genetic testing, health education, fitness classes such as spinning and Zumba, and food and retail entrepreneurs. Princess Reema is a founding member of Zahra Breast Cancer Association and CEO of luxury retailer Alfa International, which operates the Harvey Nichols department store in Riyadh. She is known for leading a movement to bring more Saudi women into the workforce. Last year, Fast Company ranked her No. 1 on its Most Creative People list for her efforts, which included ousting several dozen Harvey Nichols salesmen to hire female clerks.